A Statue of Vauquelin stands tall in the park like setting in Place Vauquelin in Old Montreal, Quebec. 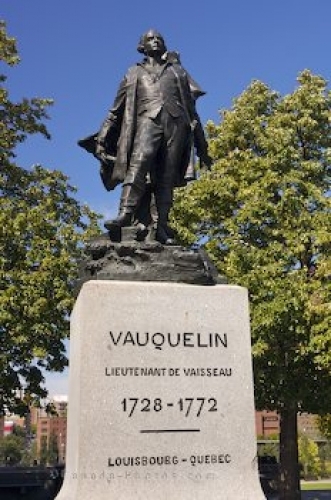 This statue is in memory of Vauquelin who was a Lieutenant de vaisseau or Ship of the Line Lieutenant from the years of 1728 to 1772 in Louisbourg, Quebec. Along the Rue Notre-Dame you can get a closer look at this spectacular statue that adorns the grounds at Place Vauquelin in Old Montreal, Quebec. Statue of Vauquelin, Lieutenant de Vasisseau 1728-1772, (Louisbourg, Quebec) in Place Vauquelin along Rue Notre-Dame, Old Montreal, Montreal city, Quebec, Canada. Picture of a statue of Vauquelin along the Rue Notre-Dame in Old Montreal, Quebec.